Entrepreneurs are betting on people quitting their plastic straw habit if there's a sustainable and easy-to-find alternative. Turns out there are plenty of them. Malibu, Seattle, San Francisco, and Vancouver are among the cities that have just banned plastic straws, with many others close to doing the same thing. The movement to jettison straws recently got another big boost when Bon Appetit, a huge food service company with cafeterias in 33 states, announced it will stop offering them. The reason plastic straws are very much in the news is simple: Our oceans are being choked by plastic and straws, while not the biggest contributor, are certainly part of the problem. Over 500 million plastic straws are used every day in the United States, and sadly, most end up in the ocean. One million seabirds and 100,000 marine mammals die annually from ingesting or getting physically trapped in plastic. More than 24,000 tons of plastic have ended up in fish in the north Pacific ocean alone. But giving up straws can be hard, especially if you’re partial to frothy, slushy, or thick and creamy drinks. So here’s some good news: Entrepreneurs are seizing the moment and producing new, more sustainable straws that they hope restaurants, and consumers, will start using instead. Reusable bamboo straws: Made from organic bamboo, these straws are washable, which makes them a reusable option. And when, after a lot of use, your bamboo straw starts to fray - which it will! - you can just compost it. Biodegradable wheat straws: After wheat has been harvested the stalk is left over. But instead of tossing or burning it, entrepreneurs are turning them into straws that are biodegradable, compostable, and don’t get soggy. Better paper straws: A downside to paper straws is that they’re prone to getting soggy. Not Aardvark straws! These paper straws last two to three hours in a drink. Other benefits: They break down in marine environments within six months and can be customized with logos and designs for restaurants intent on transitioning away from using plastic. Dishwater-safe glass and metal straws: These straws are sturdy enough to be washed and reused. That said, the glass can break and metal straws can be cold. 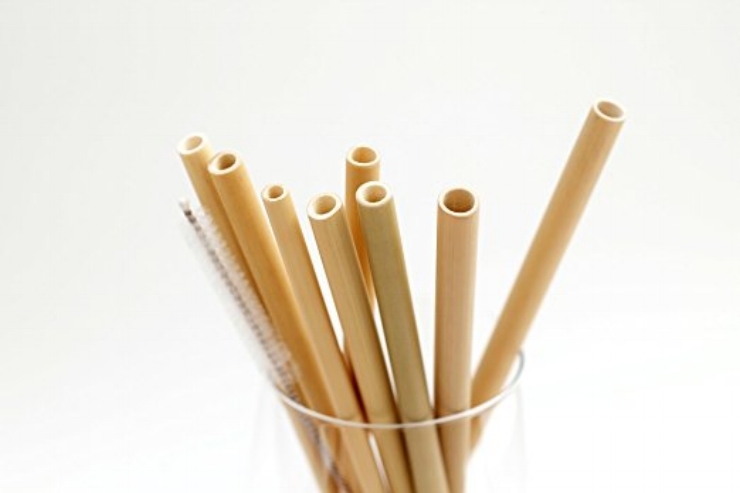 Tough silicone straws: Food grade silicone is being used to make straws that withstand rough treatment and all temperatures. These colorful, flexible straws are a particularly great option for kids, especially teething toddlers. Ocean-to-ocean straws: Made from a nutrient-dense seaweed base, these straws are edible, hyper-compostable, and marine degradable, making them as low waste as it gets. Expected to be released soon.